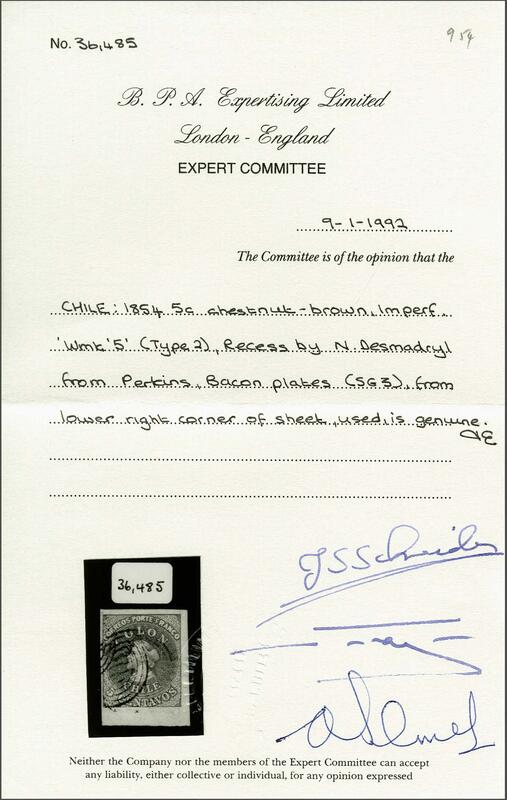 Recess by Narciso Desmadryl from Perkins Bacon Plates 1854 (Jan-Feb): 5 c. chestnut brown, wmk. pos. 1, outstanding crisp impression, a superb used example from the lower right hand corner of the sheet of 240 subjects, large margins all round with portion of adjoining stamp at top, watermark with four marginal lines at base, lightly cancelled in black. A gem for the philatelic connoisseur. Cert. BPA (1992) Gi. 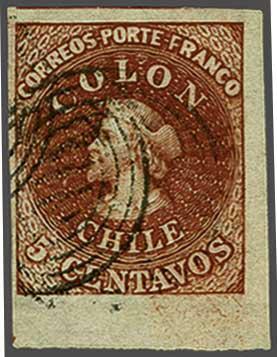 3 = £ 100+/Scott = $ 200+.rnProvenance: Collection Joaquin Galvez, Corinphila sale 62, May 1979, lot 3146; Collection Gerhard Blank, RL, Dec 1991, lot 955.